This article provides information about the Teams and Groups in the RingCentral App. Teams have names and a member can come and go. On the other hand, Groups are more ad-hoc in nature than teams. One-on-one conversations are an important part of your daily communication, but most work really gets done when collaborating with multiple people. Sometimes it's just an ad-hoc conversation among a few co-workers, which is called a group on RingCentral App, and sometimes it's with an entire project, department, etc., which is called a team on RingCentral App. Teams have names and a member can come and go. When a member leaves the team, all of their posts remain, and when a new member joins the team, they have access to the entire chat history and all content. In other words, teams exist independent of their membership. The Teams page, accessed by clicking on Teams on the left pane, lists all of the teams in which you are a member, and allows you to create a new team or join a public team. Click on the name of a team to be taken to its conversation stream. Start typing in the search box to narrow down the list of teams. Use the Show and Sort dropdowns to filter and sort the list of teams. One helpful filter is Teams I Created, which will show only the teams that you created. NOTE: "Team $companyname" is a special team that RingCentral App maintains for your company. For example, Acme's team would be called "Team Acme". As your co-workers are added, they are automatically added to this team. This is a great place for company-wide discussion. If your company doesn't use a private email domain, the "Team $companyname" won't be created until at least one other co-worker has been added to RingCentral App. Several ways to create a team. i. You can click Teams on the left pane and click New Team at the top of the page. button. ii. You can click the Plus (+) button beside Teams link on the left pane. iii. You can also click the Plus button beside your Profile Picture, and then select Create Team. A pop up will appear, fill in the necessary details. Add members to the team by entering their names. As you start to type you'll be able to select from the list of names that appears. You can even add someone here by entering an email address. NOTE: You don't have to enter all of the team members right now. You can add members at any time. • Members (except guests) may add other members - Members have to be explicitly added to the team. • Public Team (any co-worker can join) - All co-workers can join the team by clicking on the Join button next to its entry in the Public Teams section of the Teams page. The Team Description, which is optional, will be displayed at the top of the team's shelf to help people understand the purpose of the team. When you click the Create Team button you'll see the new team appear at the top of the Teams section in the left pane. Click on it to go to the team's conversation stream and start collaborating. A gear menu in the heading of each team allows you to change various settings related to the team. • Mark Unread - If you want to make sure that you come back to a conversation later, marking it as unread with set the unread message indicator next to its entry in the left pane to 1. • Favorite - Moves the team's conversation into a Favorites section at the top of the left pane. • Close Conversation - The team's conversation will be closed. • Post via Email - Displays the unique email address for the given team, which can be used to post via email. • Leave Team - Select this option if you no longer want to participate in this team's conversation. • Color - Select a color for the team to determine how the team's events are displayed on the calendar. • Mute All Notifications - Select this option if you no longer want to receive notification from the team's conversation. • Mobile Notifications - Choose from the options if you want to receive notifications to your mobile. • Desktop Notifications - Select this option if you want to receive notification to your desktop. • Email Notifications - Choose from the options if you want to receive notifications to your email. • Sounds - Override the default sound for new messages on a team-by-team basis. • Manage Members - Allows you to add more members to the team. You can also remove a member from the team or make one a Team Admin. NOTE: If you are the only member of a the team you will not be able to leave. 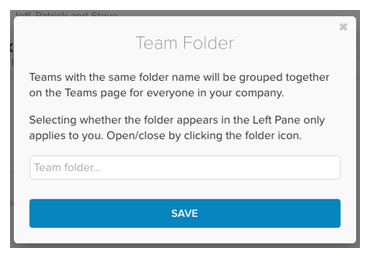 • Team Folder - You can organize teams by them putting teams into folders. Read on here to know more. • Archive Team - When a project is over, or a team simply isn't needed anymore, archive it instead of deleting it so that all of the team's content is preserved and fully searchable. Archived teams are moved to a separate section at the bottom of the Teams page so that they don't clutter up the list of active teams. You can always bring an archived team back to life by clicking on the Restore button next to its entry at the bottom of the Teams page. • Duplicate Team - Create a copy of the given team, bringing over the team's membership and/or tasks in the process. Copy an existing team, or set up a dummy team to serve as a project template. • Delete Team - Deletes the team. NOTE: You should only delete a team if it was accidentally created or if you are positive no one will ever need access to any of the conversation or content in the team. Otherwise, it is better to leave the team as-is. If it is no longer used, it will quickly disappear from the left pane as more active conversations push it off the bottom. But, it can still be found on the Teams page, and its content can still be found via search, so that it remains useful for future reference. • Add Integration - Select the integration that you want to add in the team's conversation. RingCentral App allows you to organize your teams into folders. For example, if you're a creative agency you might want to group all of your project teams by client. Or maybe you want to organize your teams by functional area. Select the Team Folder option from the gear menu and you'll be prompted to enter the name for the folder. If you're trying to add a team to an already-existing folder, as you start to type the folder name you'll be provided with a list of matching folders. Click the Save button and you'll see the folder appear on the Teams page, with the team indented below it. You can click the folder name to expand/collapse it. NOTE: All members of the team will see this folder on their Teams page as well. In other words, team organization applies across the company and isn't specific to each person. You'll notice that the folders you create also appear as new sections in the left pane. The teams associated with those folders will now appear in the appropriate folder's section of the left pane instead of in the Teams section. The folders in the left pane can be expanded/collapsed. When collapsed, the unread messages indicator represents the sum of unread messages for all teams in the given folder. When expanded, you can see exactly which teams have unread messages. By default, new folders are added to the left pane for you and all other team members. If you'd prefer not to have the folders in the left pane, just click the gear icon for the folder (either in the left pane or on the Teams page) and un-select the Show in Left Pane option. One of the most powerful aspects of this feature is that you can filter any of the apps by folder. Say you're a creative agency and have put all project teams for a certain client into a folder. 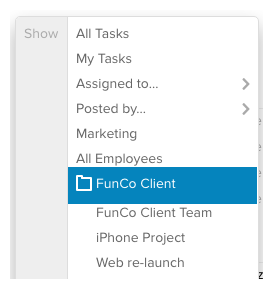 You could then go to the Tasks app and select that folder in the Show dropdown so that only tasks for that client's projects would be displayed. Groups are more ad-hoc in nature than teams. It is defined by its membership. For example, if you are talking to Dave and Lisa and decide that Ian should be part of the conversation as well, you'll need to create a new group with Dave, Lisa and Ian and Ian will not be able to see the history of the conversation between Dave and Lisa (although if there are key items in that conversation that Ian needs to see, they can Share or Move them into the new group). NOTE: Groups and People has been combined for new users. Click on the Groups link in the left pane to start an ad-hoc conversation among a number of people. Enter the names of the people you want to include in the conversation. As you start to type you'll be able to select from the list of names that appears. You can even add someone here by entering an email address. When you click the Continue button you'll see the new conversation appear at the top of the Groups section in the left pane and you'll automatically be taken into that conversation. NOTE: If you've previously had a conversation with this group of people, you'll simply be taken right back into that same conversation.